- Experience the fascinating culture and crazy nightlife of the buzzing capital of Bangkok as you discover ancient temples, learn to cook delicious Thai food and party the night away on the famous Khao San rd! - Enter the magical and relatively unknown rainforests of Khao Sok National Park. Cruise along pristine emerald green lakes, go tubing, kayaking before sleeping overnight on floating bungalows! One of our lucky tourists meeting the elephants. Certainly an experience for the bucket list. Explore the ancient temples with the 9-day Thai intro tour. Stay overnight in the beautiful floating bungalows of Thailand's Koh Phangan. We'll pick you up from the airport and take you to the guesthouse in Bangkok. You'll then have plenty of time to recover from your long flight, chill out and meet everyone in your group. Discover Bangkok from a different perspective as we take a relaxing cruise through the heart of the city. We'll then visit Bangkok's most sacred and ancient temples and travel by Tuk Tuk through the crazy streets! At night we'll head out and experience some of the best nightlife in the world. Learn the secrets to preparing delicious Thai cuisine first hand with a traditional Thai cooking class. Then you can sit back, relax and enjoy the sights of Thailand when we board the overnight train and travel down south. We'll wind through amazing limestone cliffs in a long-­tail boat to a pristine freshwater lake and will stay overnight in floating bungalows. You’ll also go kayaking, tubing and monkey spotting! We'll travel by boat to the beautiful tropical island of Koh Phangan – home of the world famous full-­moon parties. After checking in to our own amazing beachside bungalows you can spend the afternoon exploring the island or just relax by the pool and work on your tan. We’ll then head out and party on the world famous full moon party beach! A day to unwind, relax and get some well-deserved beach time. Before being pampered with a traditional Thai massage. You'll discover the beauty of the island as we travel to some of the most amazing beaches in the world. You'll go snorkelling in crystal clear water and take a short trek through the jungle to swim under waterfalls. Today you have the choice of learning the art of Muay Thai boxing or bringing some peace and harmony into your action packed trip with a yoga class. We'll then head out for our last night on Koh Phangan. 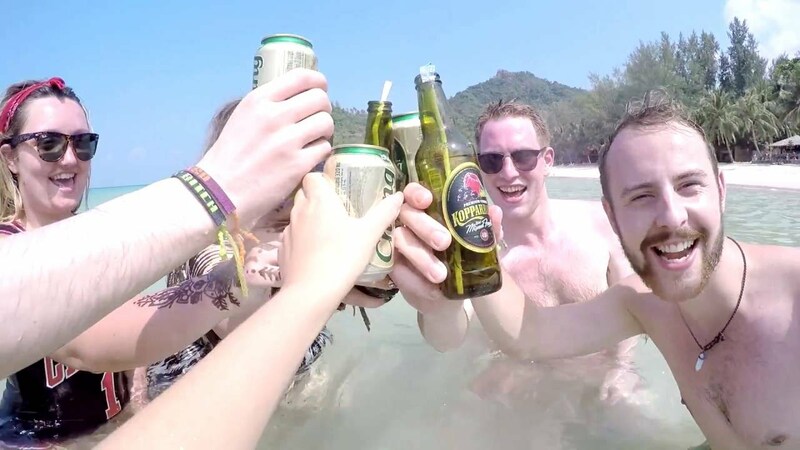 Stay on longer at our bungalows in Koh Phangan, or continue on your travels with the new friends you’ve made! A 30 Day Tourist Visa will usually be granted on arrival in Thailand for most nationalities. If unsure of visa requirements please contact us. Travel Insurance is compulsory for Thai Intro. An immersive and authentic Thai experience that allows you to get the most out of everyday on this epic adventure. Where do I begin?! This has been THE best experience I’ve had. I took the 9 day Thailand trip and I had a bit of everything! Pirate Martin was our guide!! He kept it fun and did such an amazing job taking care of us. Everything was so well planned out. Taxis waiting for us at exact times ready to take us to our next location! I will DEFINITELY travel with them again. Thaintro was an absolutely fantastic experience. I would 10/10 recommend to everyone. It still felt like an authentic "travelling" experience but without the stress, worry and time-wasting of booking transport and accommodation. The itinerary was very varied. There was enough down-time that it still felt like a vacation but also I felt like we were able to get the most out of every place we visited. I absolutely loved the trip! Every moment and every activity we did was absolutely breathtaking, humbling and inspiring. My favourite part about this trip was meeting all these beautiful people that I have grown so close with within just 9 days. Simon has managed to make us into a family that I will cherish and hopefully stay in touch with for a long time. I highly recommend anyone to join for this Introduction to Thailand! Expectation 100% fulfilled and exceeded! Had an amazing trip which a truly great bunch of people!! Saw so much of Thailand and feel in love with Southeast Asia!